Russian visitors could easily read the text: drawings of the hilt of Cossack officer's shashka, approved by His Majesty etc. etc. This is an interesting shashka type - one which has a hand protection feature: single knuckle bow. Usually shashkas don't have such a protection. Soon I will indicate the author's name, and the location of this very good article. Labels: English, kép, kozák, orosz, XIX. sz. The whole story began as a routine fact-checking search. I read a passage from László Gerentsér's book , published in 1944, that the famous Vigeant fencing bibliography did not mention any 19th century Hungarian treatises, so I have decided to check another important reference work: Carl Thimm's bibliography , where I have found - as expected - some Hungarian authors: Balassa, Chappon etc. With a sudden inspiration I have decided to search: how many fencing books were printed Buda (0 book), then in Pest . And bingo! Several search results have been found, among them two books of August Hermann. Later it would become evident that the SAGA's database already recorded this author, even included a link to the online version of 1861's book. Schlüssel zur Kunst des Rapier - und Säbelfechtens á la Contrepointe. Linz, 1861. Säbelfechten - German for sabre fencing - is a very exciting keyword for me. The first book, entitled (roughly): Basic features of a manual for sabre fencing: in addition to fencing tasks and their solution does not yielded any interesting pictures, only this one. This is only preliminary information about these two interesting sabre fencing manuals. At some stage it will be necessary to transcript Fraktura text into modern German, and then the proper translation and interpretation could start. 1300 items are listed in the SAGA database for the 19th century. Schola Gladiatoria's own link farm (19thC Treatises) contains 317 entries (links to the online version of a particular fencing book). A famous Hungarian fencing master & fencing historian (1873-1942). Before 1873 Buda and Pest were independent towns on two sides of the Danube River. Labels: English, kép, német, XIX. sz. The amount of views has reached over 40000. The last line shows the accumulated number of views from the very beginning (40172), above that there is a line which contains the last 30-day number (4673). For comparison there are two previous records: one in October 2017 (1446 views per month), and another in March 2018 (1469). I want to thank all viewers - especially the foreign visitors - who allowed the posts of this blog to reach so many corners of our planet. As I promised before, there will be even more English content, and all older posts will have a short summary section in English. Basically all Hungarian posts of 2019 already have such a section. 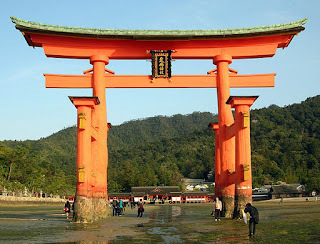 Via Dear Visitors featured post foreign viewers can browse more easily this blog. There is a list of clickable categories (labels) that provides a visitor with the possibility to view all posts related to a specific topic. With this upsurge our blog has definitely become the most viewed fencing blog in Hungary. Our competitor displays 20995 views (as of March 30). Many other blogs simply don't display this crucial number, so it is impossible to establish a completely reliable ranking. Originally I have just wanted to find more about a very special type of shinai, called fukuro shinai (roughly: shinai in a leather bag) And very quickly the whole thing transformed into a nice cultural journey. After checking the Hungarian Wiki article on fukuro shinai  I found a picture of a kenjutsu demonstration in a beautiful Japanese temple. 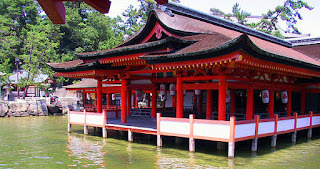 I felt I must find out more about this temple! 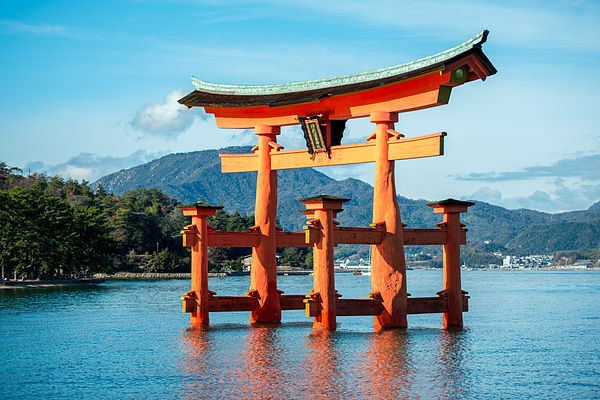 After few additional clicks I have been browsing the pictures of stunning Itsukushima Shrine. But let's return to the original topic: fukuro shinai. Daito approximate length: 98 cm; approx. weight: 500 g.
Shoto approximate length: 61 cm; approx. weight: 310 g.
And the last picture of the shrine. There is also a German version of this article. Pictures are from this site. Labels: English, kendó, XXI. sz. Originally I thought that I will name this post something like West vs East, or Versus II, or HEMA vs kendo, but those names were so obvious that I have rejected them almost immediately. A bamboo shinai of the kendoka (Marcello) crossed a plastic sword of the practitioner of the Bolognese swordsmanship (HEMA instructor Fabio Serraglio). The fencing match was hosted by Enrico Campobello in his Sala d’arme Il Carmagnola. You can watch the video of this bout at YT, narrated by Federico Malagutti. Just to show that I could appreciate cool actions on both sides. A nice one-handed thrust by the kendoka. The tip of the shinai hits Fabio at the moment when his attack is still in progress. Secondly it is really good to see that a well trained HEMA swordsman could fence elegantly an equally well prepared kendoka. 10 years ago at the biggest Hungarian martial arts forum a senior kendora simply derided HEMA fencers, their equipment (weighted shinais with a crossguard), and generally their level of swordsmanship. Good to see that the situation has changed forever! My sincere congratulations to both fencers, to the organisers of the event, and to the narrator, Federico Malagutti. Fabio has the right hand of the kendoka completely under his control, securely jamming the hilt of the shinai against his torso with his left hand, while delivering the finishing cut to the head. A Hungarian archeologist visited several museums of the Kuban region (Anapa, Krasnodar) in order to find artifacts that could be connected to the time of the Hungarian Conquest of the Carpathian Basin (around 895). Unfortunately all these artifacts were found by local grave robbers so no proper archaeological context can be established. 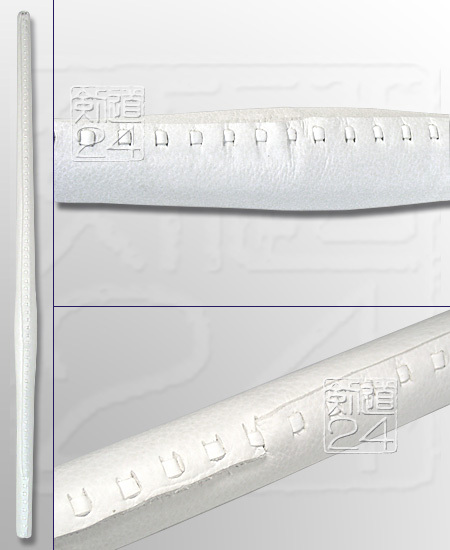 It is interesting to observe three spikes on the inside curve of the sabre handle. Sometimes we can see very similar spikes on sabres of the Saltovo-Mayaki culture. These pictures are parts of the screenshots from a Gabriella Lezsák's YT video about her two visits to the Kuban region of the Russian Federation in 2016 and 2017. Artifacts from the Kuban region in Mardjani Collection (Moscow). Изначально этот блог был задуман, как исключительно венгерский интернет-дневник по тематике: фехтование, сабли и прочие мечи. Со временем стало очевидно, что здесь бывает очень много иностранных, в том числе русскоязычных посетителей. Если у Вас есть вопросы или замечания касательно отдельных записей или всего блога, то в конце каждого поста есть линк No comments, где есть возможность написать свое сообщение, даже полностью анонимно (Comment as Anonymous). Когда будет однозначно видно: какие самые популярные темы, тогда - с помощью друзей - буду писать и русские посты. Basically the same as the Dear Visitors post.